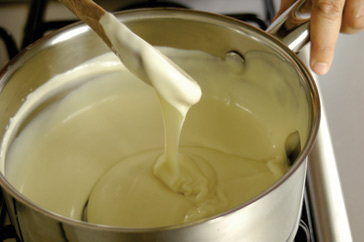 In heavy saucepan, heat the milk with the vegetables and spices until it bubbles around the edges. Remove from heat and stand for about 20 minutes then strain. Wipe out saucepan and melt the butter in it. Remove from heat and blend in flour and stir over a low heat for about 1 minute. Cool a while and add the milk and stir until smooth. Stir over medium heat until it boils and then lower heat and cook a few minutes more - about 3 minutes longer.